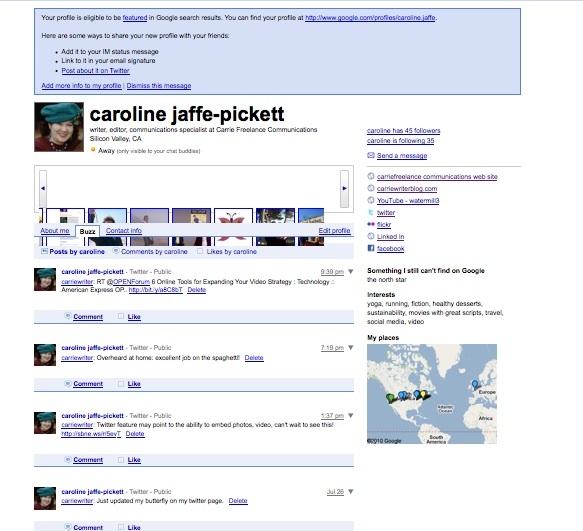 This screenshot of my Google Profile page shows my social media links, recent tweets and posts, and my Flickr photo stream. 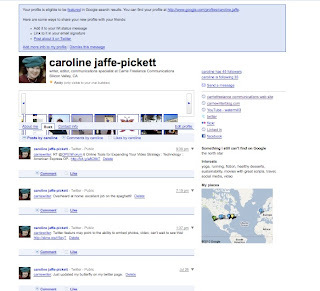 A few months ago, I completed my Google Profile online, which was great, except for one thing -- I didn't know what to do with it. Now, I do. 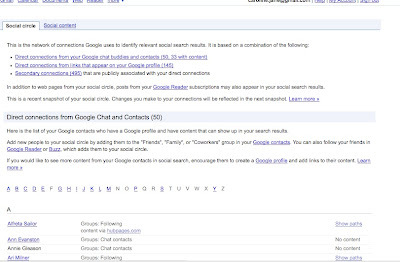 Google has launched in Beta a new feature that enhances online visibility by producing search results that include the contacts in your Social Circle. Who is your Social Circle and Why Are They Important? Basically, your circle includes all your online connections, including Flickr, Facebook, Twitter, YouTube, Friendfeed, LinkedIn, and of course, your G-mail contacts and Google Reader/Chat/Buzz connections. The idea is that when you go to research something online, you probably want to know what someone you already know thinks about it. Maybe it's a marketing tool, or a new restaurant or hotel, or even a book or movie.The SEO and "getting found" value of this is a huge plus. The more your name and links pop up, the more not only your friends and connections can find you, but others as well. Set up your Google Profile (you need a Google account), and follow the prompts to fill in your contact information, social media links, bio, and any other information you like. Note that this isn't something you need to go back to and update -- if you complete it the first time you should be good to go. When you are finished, you will get a profile link, which you can then add to your blog, social media profiles, signature tag, etc. You can also tweet it and promote it through all social media channels. When you are next searching online, check the search results and look for an entry that reads: "Results from People in Your Social Circle." Here, you will see names that should be familiar to you, and just as their names are coming up, so should yours as well, depending on the topic. 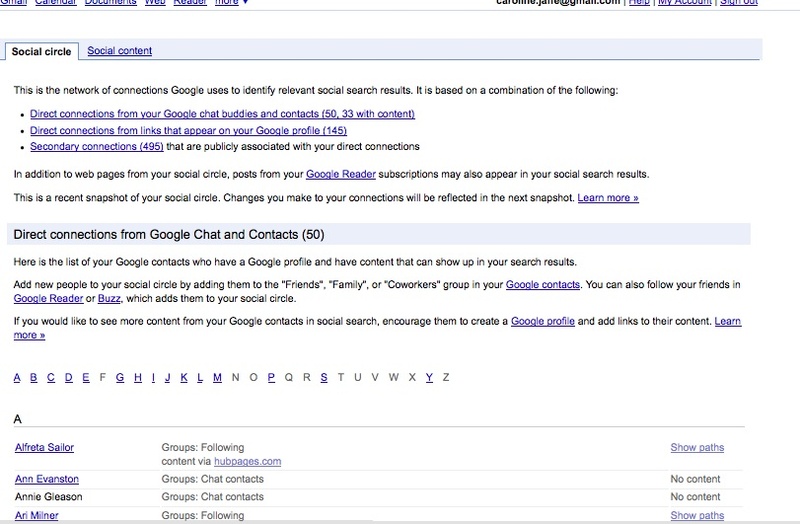 If you don't see the Social Circle results, click for More Results and continue looking on the next page or 2. I just did an experiment using the search terms "Video Marketing," and "Social Media Marketing," and in both cases the social circle names I recognized came up. Social Circle results for the search term, "Video Marketing"
A quick footnote: a Google profile is also a great way to get a snapshot of your connection's online life, and features all their social media links, recent posts and tweets, and an easy way to contact them on e-mail. You can also see who their connections are as well, providing a cool social media window of potential friends and contacts. I've included my Google profile link here, feel free to connect with me, and if you're trying out the Social Search, let me know how it goes!